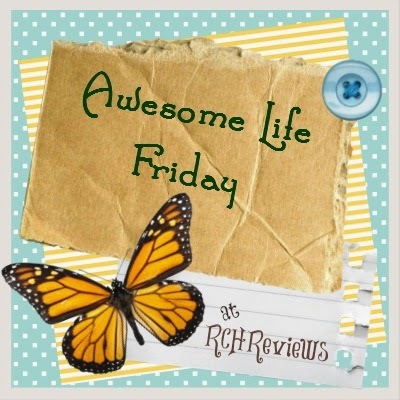 We had a really fabulous week! 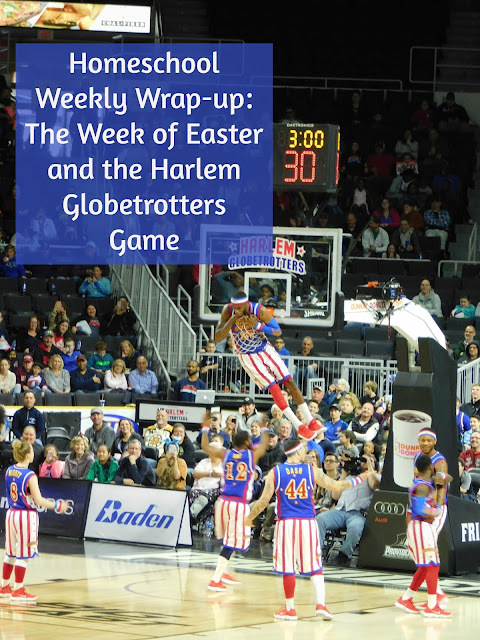 Between a Harlem Globetrotters game, Easter, and lots of fun crafts with the kids we all had lots of fun and laughter. I even managed to plan a short little family vacation for the start of summer for us! How did your week go? It rained all day on Friday but that did not stop the boys from playing outside. Alec even went on another bike ride. Sure he was quite muddy by the time he arrived home but he had fun. The boys are each down to one subject each for school so I asked them to please double up on the work which means the older boys are completing 4 pages in math (as long as it's not a difficult concept they're struggling with). We all sat down to do some art in the afternoon. Alec and I worked on painting some cat silhouettes in the moonlight (I'll have a full post with the completed paintings next Thursday) while Ian drew some construction trucks and Evan tried drawing a shark using our Draw Write Now books as a guide. Alec and I finished off our day with a rousing game of Ticket to Ride... he won; again!! We had tickets to go see the Harlem Globetrotters on Saturday. Alec and I went on a nice long bike ride in the morning while Ian headed to work with his grandfather. We left at lunchtime to go see the show and we had a great time. It was hilarious and even though none of us are huge basketball fans we had a good time. They put on a great show and I highly recommend going if you ever get the chance. Easter Sunday the boys woke to their Easter baskets. I'm still not sure who really believes and who doesn't so I tend to just silently watch and take photos. It was the first year we had no egg hunt but the boys had been warned that this family tradition was ending ahead of time so they were OK with it. 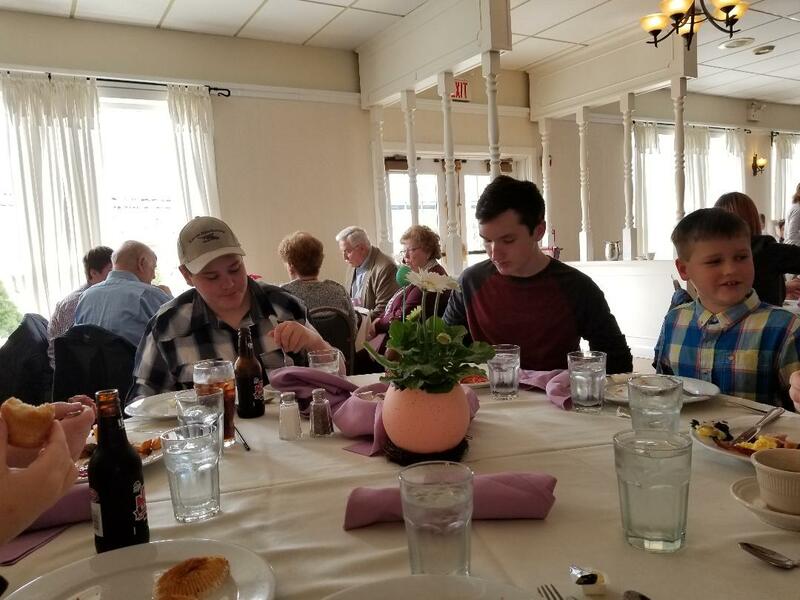 We didn't have "brunch" reservations until 3:00 in the afternoon when we met up with my family at the very country club where my husband and I were married almost 17 years ago. In between opening baskets and meeting up for lunch we had a family cleaning day and cleaned the whole house top to bottom. It was so nice to have all that help! After our late brunch, my husband talked us into taking a walk in the woods. We had no idea just how many trees had fallen onto our trails since we just swept the trail a few weeks ago. Everyone got a pretty good workout clearing sticks and brush. Monday morning we woke to snow! It snowed until just past lunchtime and we had a few inches accumulate. I had a memorial service to go to and the boys were able to stay home; my husband was working just minutes down the road and surprised them all with lunch from Subway. Before leaving we had just enough time to check on our science project from last Monday and run one more quick experiment with the cotton candy. After finishing up schoolwork on Tuesday and after Alec went to karate we played a few games. It was a rainy day and were stuck inside anyway. Evan asked me to play Labyrinth and then Alec, Evan and I played a few rounds of Zeus on the Loose. I had a hair appointment in the evening and when I got home Ian was excited to show me that he finished up one of metal models from last month. The boys finished up any schoolwork they had rather quickly on Wednesday and the younger two headed out to play. It was wet and overcast but the rain had not yet started so I gladly sent them out to play while they could. Once they came in we decided to work on some possible mother's day gifts. We crafted some pretty mason jar luminaries and then the boys went off to play video games for the afternoon. My husband was home from work just a it early and suggested we all go out to dinner. We headed to the Cheesecake Factory and had a really great night out together.. I was so happy to finally get my chicken madeira that I've been craving for weeks! Ian woke feeling pretty crummy on Thursday and so I offered to run to the store and stock up on some cold medicine for him. Thankfully Ian is only sick with a head cold and he even managed to finish up his schoolwork along with the other two. We all had a slice of cheesecake for breakfast (I don't know about anyone else but we never have room for dessert after eating there!). We read a book on the Erie canal and another couple chapters in our latest family read aloud. After lunch the younger boys and I took off to the park to meet up with some friends while Ian decided to stay home and rest/ watch TV. 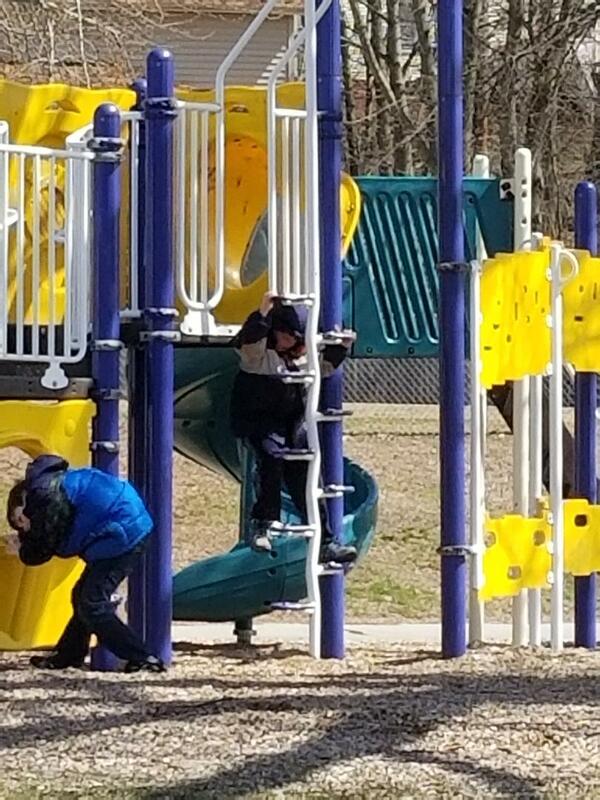 It was quite chilly at the park but it was nice to get some exercise and see our friends. I just keep hoping warmer weather will be here soon! The Globetrotters are so great. Every kid should see them at least once. Love seeing your Easter fun! My boys weren't all that thrilled to go but I told them I had always wanted to see the Globetrotters and I promised they'd have a good time. I think they enjoyed it. I know my oldest did but it can often be hard to tell with teens and tweens. LOTS of fun stuff!! I remember the Globetrotters from when I was a kid - amazing that the organization is still around! Thanks for linking up! It was wonderful! I was surprised to learn that they were sill around too; I remember seeing them on all sorts of TV shows growing up. Looks like you all had an amazing week! I am always so glad when we get close to the end of the book work. We still do a lot during the summer, but the workbook pages are done for awhile and we make sure to have a much more "free" schedule. It is super nice! We definitely don't take the summer off but we do set aside the books and look forward to more hands on fun.